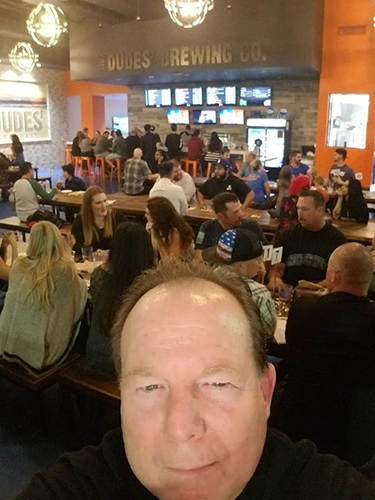 The Santa Clarita location is the fourth tasting room for The Dudes' Brewing Co.
Last month, The Dudes’ Brewing Company opened their fourth tasting room at Westfield’s Valencia Town Center. The Dudes' Brewing Company was represented by Kim Simons and Ken Simons from our Westlake Office. Kim and Ken have been representing retail tenants in Southern California for over 25 years. Ken Simons at the recently opened tasting room in Santa Clarita. Located at 24250 Town Center Drive in Santa Clarita, the 4,700 square foot facility provides 24 unique brews every day, ensuring that there is something for everyone from the casual beer drinker to the craft beer aficionado. Everything from the seating arrangements to the the rotating pizza menu is designed to invite patrons to relax and enjoy a unique brew. Communal tables provide a venue for a casual hang out or even hosting a large group. The location features vintage video and arcade games, televisions for watching sports and pizza remniscent of Northern Italy. The Dudes’ Brewing Company is a family owned and operated craft brewery founded in 2013 and headquartered in Los Angeles. The Brewery is located in Torrance, California. Other tasting rooms are spread across Southern California in Huntington Beach and Thousand Oaks. Tasting Rooms in Hollywood and Santa Monica will be coming soon.